​After the Battle of Caseros, Buenos Aires had become a separatist state held by the Unitarian Party. When losing Buenos Aires and the Eastern Band, the rest of the confederated provinces, they were without leadership. Separated and seriously weakened, they marched thus to their final defeat in the Battle of Pavon in 1861. After the Battle of Pavon, there were a series of provincial uprisings headed by Caudillos, which were repelled by the army of Buenos Aires (Process of organization and national unification). In the photo above, you can see the staff of General Felipe Varela. In the photo you can see a mixture of civilian or gaucho clothes and the remains of military uniforms. The officer in the middle is wearing an early French kepi of the Second Empire in civilian clothes. 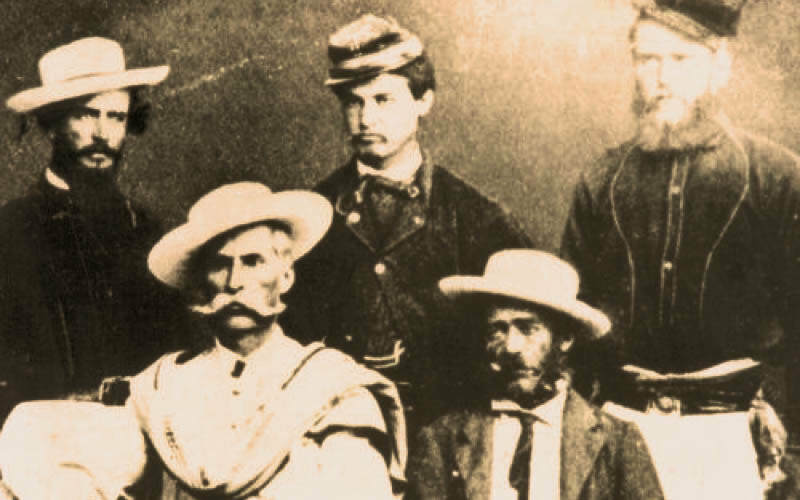 He is like the man on his left, but he is wearing a cavalry shirt from the Argentine Confederation. 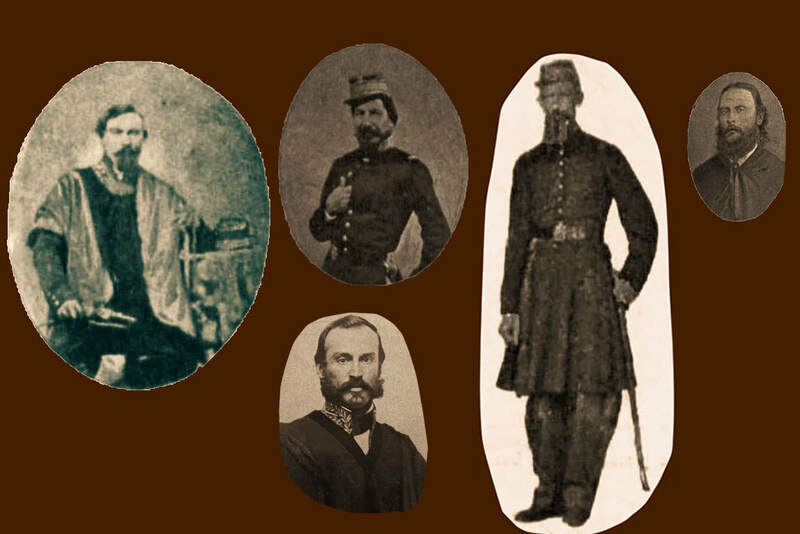 In several daguerreotypes shortly after 1852, there are military officers and national guardsmen of the Argentine Confederation, from various provinces, with French uniforms of the Second Empire tailors, as well as the armies and the national guards of Buenos Aires. The troops of the Argentine Confederation post-1852 still wore the old uniforms of the Federal Army combined with uniforms of the French regulation and with clothes and weapons of other origins, since each province had its own foreign trade. This was the main reason why, in 1852, some federal chiefs allied with the unitary leaders (Argentines and Uruguayans) and the Emperor of Brazil to defeat the Government of Rosas and its customs centralism. Paradoxically after the Federal defeat at the Battle of Pavon, the Unitarians of Buenos Aires subjugated the rest of the weak provinces and imposed National Unity and customs centralism. General Ricardo Lopez Jordan. General Carmelo Campos (Lieutenant of the Gral Lopez Jordan). Coronel Ramon Gallo. Sergeant Major (Major) Simon Luengo. Nicomedes Coronel. With the exception of General Lopez Jordan, the rest are wearing French made uniforms. The tunics are model 1845, the same model used at that time by the National Guard of Paris, and French colonial kepis of the time (Napoleon III). General Lopez Jordan wears under his poncho a jacket of high officer of the time of the Argentine Confederation, which were of the same style as those used since the War of Independence. ​In those daguerreotypes, protagonists of armed uprisings appear, along with resistance to the authority of Buenos Aires. On the left, the legendary General Juan de Dios Videla when he was Lieutenant General to Felipe Varela on his right. In the middle General Indian Chief Catriel and the provincial Caudillo Ángel Vicente Peñaloza. General Juan de Dios Videla was a veteran of the Battle of Caseros, commanding as a colonel a Cavalry Division of the Argentine Confederation that took his name during the battle. He still wears the pants of a high ranking officer of the Confederation. Cacique Catriel wears a red blouse from the time of the Argentine Confederation. The photos below, weapons and knives that Angel Vicente Peñaloza had used. ​Political, Art and literary legacy of the Argentine Confederation towards the end of the 19th century. Adolfo Saldias author of "History of the Argentine Confederation, 1881/1883". Lucio V. Mansilla author of "An Excursion to the Ranquel Indians".José Hernández author of the epic poem "Martín Fierro". Leandro Nicéforo Alem, veteran of the battles of Cepeda, Pavon and the War of the Triple Alliance, politician and deputy of the nation in 1895. Roque Sáenz Peña, journalist, military of the Argentine National Guard and Peruvian general, veteran of the War of the Pacific, politician and ex-president of Argentina between 1910 to 1914. Reynaldo Giudici. 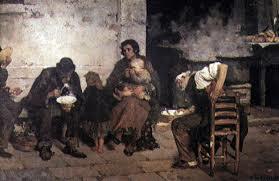 Giudici (1853 - 1921), was an Argentine (Italian born painter). Among his works are the portrait of General Pacheco, and "The soup of the poor". Bernardino Rivadavia (Unitarian flag), Gervasio Artigas (Federal flag) and Juan Manuel de Rosas (Argentine Confederation flag). ​The maximum political exponent of the Federal Party was José Artigas the founder of the "Union of the Free Peoples". The Unitarian Party had Bernardino Rivadavia as the promoter of the liberal ideology, and as liberal centralism in the style of the French state. The ex-Spanish colonies of the Rio de la Plata, were divided into a long struggle for centralism or federalism. However, in the course of that struggle there were clashes between federals. Federal warlords fought allies with the Unitary Caudillos against the centralism of the Federal Government of Buenos Aires. In the Battle of Caseros, Federal and Unitarian under the command of General Urquiza joined together with the Empire of Brazil against the Government of the Argentine Confederation. In Buenos Aires, Federal and Unitarian forces joined under orders of Juan Manuel de Rosas against what they called a kind of second war against Brazil. For this reason, the Battle of Caseros cannot be considered another page of the struggle between Unitarians and Federals. After the Battle of Caseros, the Unitarian Party and the Federal Party officially dissolved in 1862 and 1868 respectively. The two antagonistic sides were diluted in adapting new ideological tendencies but with their liberal or conservative remnants.